We offer a comprehensive selection of mobile devices in both Windows and Android OS Formats. All ruggedized and a perfect fit with our ENCOMPASS SPC system. 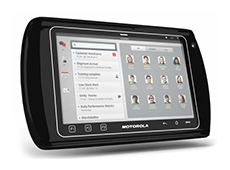 The Motorola ET1 is a ruggedized Android handheld tablet that includes a Citrix client for enterprise wide communications. It also includes a very nice handheld strap that keeps the unit secure will in use. The ET1 includes a camera for visual inspection data upload and a scanner for bar code data entry. 3 year warranty included-even covers drops!